Rosemary is popular and commonly used in the cookery as it provides dishes with inimitable flavour and aroma. However, not many people know its second and more aesthetic quality. Rosemary is used in cosmetology and it triumphs in taking care of skin as well as face, hair and teeth. 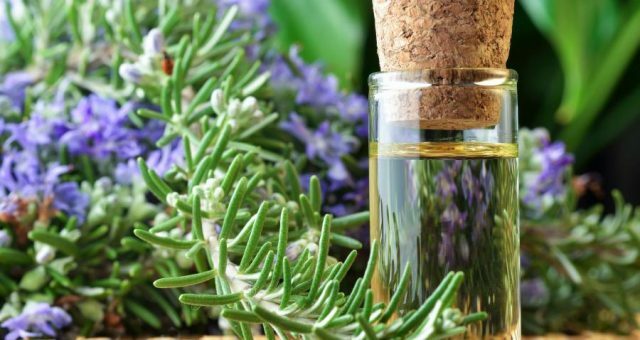 What are most important cosmetic properties of rosemary? 1. It’s used for improving health and condition of our hair. It’s ideal for conditioning both dry and oily hair. You can use it as a shampoo, mask or simply for hair oiling (rub the oil into dry or damp hair as well as the scalp, leave it for at least an hour, then wash the hair with a delicate shampoo). The oil will also fight split hair ends and what’s more will stimulate hair growth. 2. It’s common in herbal toothpastes. The addition of this herb helps to combat bad breath and leaves long-lasting feeling of freshness. 3. It makes you feel better – rosemary oil helps to fight stress and depression, also gives more energy and makes you want to live. I would venture to claim that life with rosemary becomes more beautiful! 4. Heals not only wounds of soul – it deals well with any cuts or scratches on our body. It gently sterilizes and won’t let the infection develop. 5. Regenerates the skin – it destroys microorganisms and thanks to this the skin has a chance to regenerate. So it will also be ideal for the skin which struggles with acne because it can fight pimples and ugly acne scars. 6. Sportspeople like it because rosemary oil used for massage provides overtrained muscles with relief and soothes any muscle injuries. 7. Added to a cream, it will perfectly stop any aging processes like skin getting flabby and wrinkles. You can also rub the oil into your face. It will provide the skin with quick moisurizing and firmness and the wrikles will get ironed. 8. It spectacularly fights cellulite. It’s worth to use it to massage any parts of your body experiencing orange peel. 9. Rosemary bath will set anyone up, even after a very tiring day. It’s really worth to get the rosemary from our kitchen and move it into the bathroom for good.